The Mobility and Opportunity for Vulnerable Employees (MOVE) Act, a bill proposed by Democratic Senators Al Franken and Chris Murphy seeking to outlaw non-compete agreements for low-wage employees, has come under a fair amount of criticism. By way of background, this bill came about, in large part, due to a public outcry that large restaurant chain owners, particularly, Jimmy John's, sought to (unfairly) bar their minimum-wage earning employees from working in a similar capacity within a 3-mile radius of their stores. To be sure, large chains would be hard-pressed to demonstrate that they have a "legitimate interest" in preventing one of these low-wage earners from working at a competing franchise; it's not exactly as if these employees are likely to have access to any truly sensitive proprietary information that would threaten the integrity of the business. That has not prevented some from levelling rather vocal opposition to this bill, as critics, such as Eric Meyer, have noted that even according to the bill's proponents, it is largely a "shaming exercise," and only applies to roughly 10% of low-wage employees nationwide, leading to the conclusion that there is "no need to break out the legislative handcuffs for an issue that needs no policing." But is that criticism valid? On the one hand, I wholeheartedly agree with the notion that legislation shouldn't be pursued if its stated goal is "shaming." First, Meyer's premise that 10% of a particular work force is unworthy of legislative protection is just plain wrong; that is an awful lot of people - not an insignificant few. 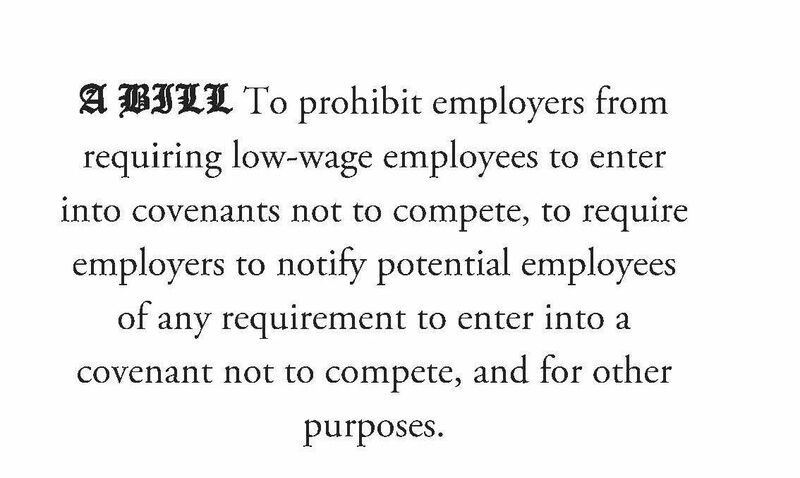 The proposed bill does not seek to prevent employers from binding mid-level (let alone senior level) employees to non-compete agreements. In sum, is the vocal criticism of this bill warranted? Post a Comment to "Is Criticism of Senate Bill Banning Noncompetes Valid?"